"A venue which is gathering a national reputation for boundary-crossing shows"
"Honour to the little theatre"
"One of London's hidden treasures"
"I can't wait to work on new performances. My confidence has grown so much and I have developed my acting skills." "A nurturing home for cross-artform collaboration"
"Thanks so much for everything. For giving me confidence and making me sing better." Young People's Theatre on TV! CBBC show 'Friday Download' came along to the theatre recently to show some of our Young People's Theatre a magic trick and find out just how special their weekly sessions are to them. Have a look HERE to see us in action! Blue Elephant Participants in Gareth Malone's All Star Choir! 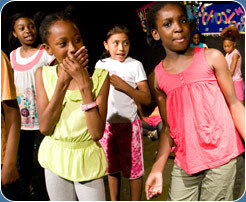 Our exciting Young People’s Theatre, supported by Children In Need, offers workshops on Saturdays to local young people. The Young People’s Theatre has been running for the past 12 years and is still going strong! 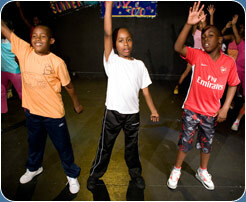 Workshops are free for Southwark residents and are available for young people aged 7 to 18. Participants work towards an exciting performance at the end of each term onstage at the Blue Elephant Theatre to an invited audience of parents and carers. Participants get to be part of a company devising their own work as well as performing from scripts. Participants also work on other art forms such as music, dance, puppetry and mask!. The groups have had the opportunity to perform at lots of different venues including Theatre Peckham, Arts Depot, The Globe and the Unicorn Theatre. There are regular trips to other theatres including West End shows. We have over 100 participants attending our Young People’s Theatre on a weekly basis. Our Young People's Theatre aims to provide drama based workshops to young people who would not normally be able to access such services for social, economic, or other reasons. Young People's Theatre runs on a weekly basis. The current term runs from 22nd September to 1st December.